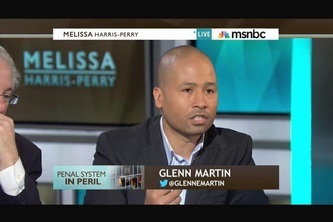 Today, Glenn E. Martin is an accomplished prison reform advocate who has co-led such organizations as The Fortune Society and the National HIRE Network at the Legal Action Center and is currently developing JustLeadershipUSA. He has written for the New York Times, appeared on cable news shows and has had the ears of powerful people such as New York City’s former mayor, Michael Bloomberg, and Archbishop Desmond Tutu. After discussing the proposed “Ban the Box” legislation on Al-Jazeera America, I was fortunate he met me for an interview at a coffee shop in downtown Manhattan. Very personable and forthcoming, he provided me with great fodder for Tonight at Dawn’s series on prison reform that will also be informed by interviews with Professor Scott Bowman of Texas State University, prison reform advocate, Carol, of the Prison Reform Movement blog and other resources. Glenn’s success as an advocate was born out of his own experiences in the criminal justice system and life in the inner city. Thanks to the British school system in Grenada, the boys had a stronger educational foundation than most of their peers in Brooklyn and Glenn’s mother ensured each of her sons earned their high school diplomas. Having not graduated from the twelfth grade, she saw this as the pinnacle of achievement in a time in the United States when college degrees had become the minimum required for most good jobs. With the lack of favorable possibilities modeled in their surroundings, it was only her eldest son who slipped out of the “proverbial fence around the ‘hood” quickly enough to avoid trouble. He escaped directly to the Navy after graduation, and through the opportunities he was exposed to and afforded through his experiences in the armed forces, Glenn’s older brother built a good life for himself far beyond the perimeter of Bed-Stuy. Motivated to be sovereign from public assistance, Glenn’s own plans to join the army were not enough to tame the lure of tangible opportunities in the streets. Within a year of graduating high school, he was arrested with a weapon in Manhattan. Returning to the only opportunities that appeared real for Glenn at the time, he engaged in armed robberies until he was finally arrested with a high bail and a possible 20-40 year sentence. His first stop? A year in the infamous Riker’s Island prison with at least one stab wound as a souvenir. Throughout the Prison Reform series at Tonightatdawn.com, I will share Mr. Martin’s story, his evolutions and his insights into how the system should be changed along with perspectives from academia and a mother of an incarcerated male. 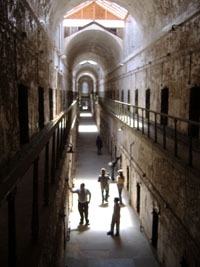 Please stay tuned for the next post in the Prison Reform series at Tonightatdawn.com: Part 2: “Looking Upstream” in which causes and prevention of incarnation will be discussed. Glenn E. Martin, Founder of JustLeadershipUSA.” Personal interview. 26 June 2014. Orange is the New Black returned to Netflix yesterday with a second season ready for binging. While I am certainly tuning in to see Chapman’s fate with her wrecked romances and her Christmas run in with Pennsatucky, I am also interested in some of the social issues the show embeds at times. Some of the story lines are fodder for conversations about the failures of our social systems from education to job programs to racial inequities to the lack of rehabilitation and support for released prisoners. At the beginning of the second episode of the new season (where I paused to go to sleep last night), we see a younger version of Taystee at an adoption fair where her hopes for a family are dashed. There are glimpses in the first season where the viewer is getting a perspective beyond her playing the “clown” and we see an intelligent woman whose promise has been unrealized. Brooks’ character speaks to the large number of youth who spend their childhood in the “system” which does not model how to function outside of it and prisoners who are ill-prepared to renter society. I am looking forward to continuing my discussion with Carol and other prison reform advocates regarding recidivism and other issues that has bolstered the United States to lead the world in incarceration rates; we have 5% of the world population yet we incarcerate 22% of the world’s prisoners. In a country that prides itself on freedom and opportunity, there is clearly something that is broken. Whether or not the second season of Orange is the New Black delves more deeply into the myriad of problems that feed the prison system in the United States or not, it’s still can be an excuse for much needed conversations. For the sake of our nation and our communities, we need to have all of these conversations on education, race, inequities, prison reform, the privatization of prisons, etc. If you have any insight into any related topic, please comment on this piece and perhaps Tonight at Dawn can interview you for upcoming post. In the meantime, please check back for a follow up article on prison reform. Cecchini, Kimberly. “Carol Leonard, Advocate.” E-mail interview. 27 May 2014. Orange Is the New Black/Fool Me Once. Netflix. N.d. Television. “Recidivism.” Bureau of Justice Statistics Reentry Trends in the U.S.:. N.p., n.d. Web. 05 June 2014. “You Might Also Be Interested In:.” U.S. General and Prisoner Population as a Percentage of The… N.p., n.d. Web. 06 June 2014.